Price as of 04/20/19 09:31PM CDT. 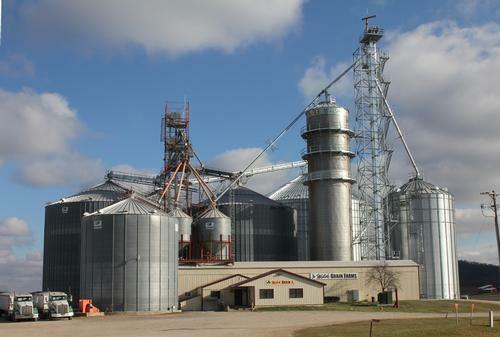 Walsh Grain Farms Inc. is a family owned and operated grain handling business in Mauston,WI. We are located 4.5 miles east of Mauston on Hwy 12 & 16. John E. Walsh Sr., President, founded the business in 1980. We became incorporated in February of 1985. John Walsh Jr. is the Grain Manager giving the farmers the best price in the area. Seth Laehn, son'n'law, is also in the grain plant assisting John. Judy Neve is the Office Manager along with sister, Jane Salverson, handling the office bookkeeping of the business. James Walsh is the Shop Manager keeping all the trucks and equipment in top shape. Dave Walsh is the Manager of the Walsh Bio Fuels Plant. Walsh Grain Farms Inc. has a storage capacity of 2,500,000 bushel of corn and soybeans. We have 20 tractor-semis serving the area farmers assisting them with getting their grain from the field to our facility.